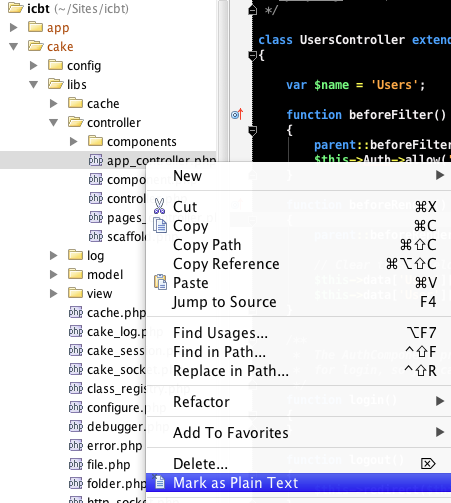 After playing around a bit today I finally figured out how to get PhpStorm to auto-complete methods for models and controllers. Here's what you need to do. First, let's tackle the multiple definitions problem that we see below. There are multiple places defining AppController. We need to remove the ones that are included in the following locations from our 'Directories' in the project's settings. Next we need to mark the following file as plain text. 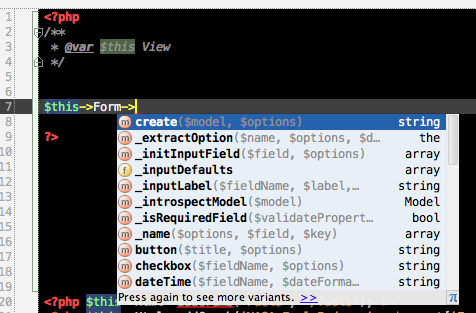 You should now see that PhpStorm is no longer complaining about multiple definitions. If it is you may want to check your plugins/components to see if they're mucking it up. If they are, just mark the file with the definition as plain text. Auto-completion should now work for the controller. However, it's still not working correctly on our model. To fix the model we need to add a magic property to the class. Here's an example from the controller we've been working in. We can now auto-complete on our models in the controller. Lastly, we need to add magic properties to our models to define its relationships with other models. Basically, for each "belongs to" relationship defined in the model's file you need to add the magic property comment. We can now auto-complete these relationships. To get auto-completion working in views we need to include a file created by junichi11 over at GitHub. Download this file and save it in a directory somewhere outside of your current project. I did this so I could use the same file on multiple projects. Now add that directory to your current project. Open a view file and add the following variable definition. You should now be able to auto-complete helpers in your view! 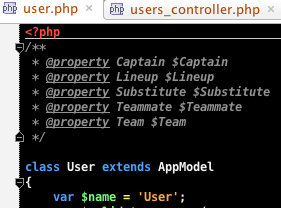 Add the following to your app_controller.php file and this will add component auto-completion.